Poikilocytosis is a red blood cells (RBCs) disease in which 10% or more red blood cells are developed into abnormal shape most commonly in a spherical shape. These abnormal shaped red blood cells are commonly described as poikilocytes. Poikilocytes are categorized into several types such as teardrop cell, target cell, spherocyte, sickle cell, schistocyte, acanthocyte, Ovalocyte , bite cell, echinocyte. 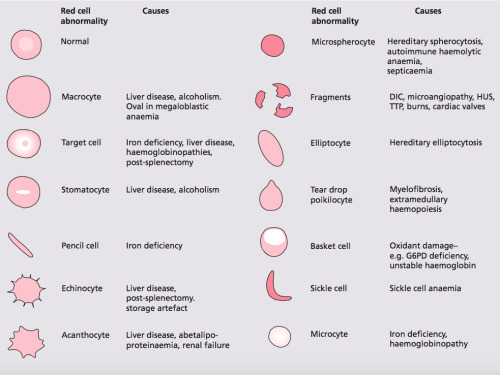 Classification or categorization of poikilocytosis types depends on two factors shape of the red blood cell and diseases or conditions associated with this disease. Poikilocytosis is defined as abnormal development of red blood blood cells or poikilocytes circulating in the blood in free form. These poikilocytes can be seen though microscope by preparing a thin film of poikilocytes on microscopic slides. 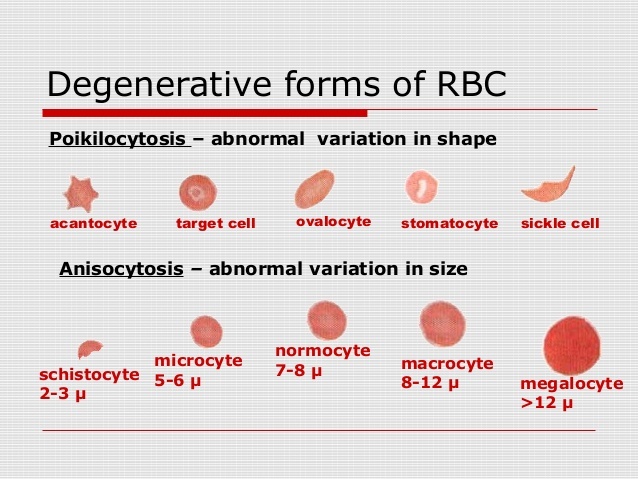 Generally these poikilocytes are about 10% or more of the total number of red blood cells (RBCs). 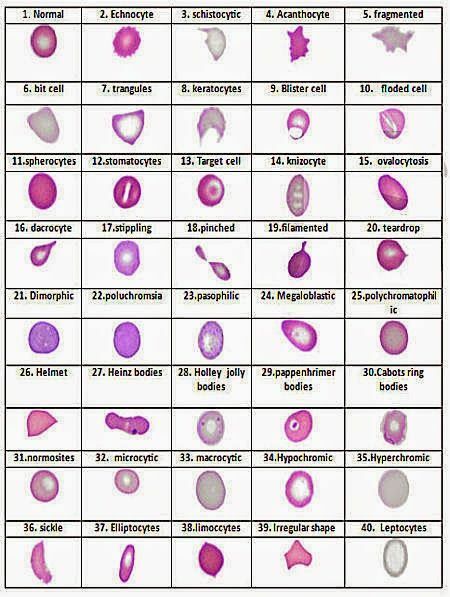 As name indicates these poikilocytes or RBCs are termed as teardrop due to their resemblence with tear drops. Poikilocytes or RBCs have shape like sphere or having spherical shape are termed as spherocytes. These are cup shaped Poikilocytes or RBCs. There are number of possible causes for poikilocytosis some them are given below. Vitamin B12 or Cyanocobalamin inadequacy is most commonly caused by inability of intestine to absorb sufficient amount of cyanocobalaminon. Vitamin B12 is vital precursor for production of RBCs. Vitamin B12 deficiency may cause some serious problems like neurological disturbances or neuro-degeneration, impaired co-ordination, lack of production of RBCs, anemia and poikilocytosis. Vitamin B12 deficiency may be cured through diet but severe type of vitamin B12 deficiency can only be treated by giving vitamin B12 through intravenous route. Folic acid or Vitamin B9 is another important precursor which plays key role in biosynthesis of RBCs. Folic acid deficiency is more common in women than men due to pregnancy, increase metabolic requirement of body, stress and hormonal effects on body. Folate deficiency may lead to anemia or poikilocytosis due improper production of red blood cells (RBCs). This deficiency can be treated by increasing intake of green leafy vegetables because of high amount of folate present in them. Poikilocytosis may be associated with some kind of other systemic disorders like ulcerative colitis, enteritis, celiac disease, gut disorders and chronic diarrheal conditions that causes impaired absorption of intestines. In this test different blood compoenents like RBCs, WBCs, Platelets, Hemoglobin etc are analyzed for possible deficiency of one of these components. In this test a thin film of RBCs is prepared on slide and then analyzed under microscope by magnifying it at suitable position. This test distinguishes the auxiliary deformation of the RBCs. Hemoglobin is another important indicator to identify poikilocytes. This is very simple test and can be performed easily. Procedure of this test is same as of complete blood cell count. Poikilocytosis treatment depends upon the severity of disease. For example if patient has poikilocytes count then intravenous administration of blood products and important nutrients is necessary in order to cope with emergency condition. 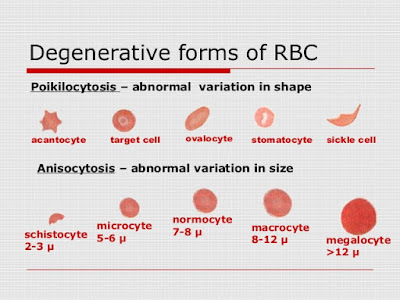 RBCs shape deformity is basically a genetic disorder that has symptomatic treatment but can not be eradicate completely. Patient may require some chemotherapeutic agents at some stage to avoid to restrict the development of bone marrow cancer. In mild to moderate cases oral therapy is quite effective to treat RBCs deficiency like intake B-complex enriched diet like green leafy vegetables, eggs, dairy products, milk and red meat.